Just Culture for Organizations Overview™ is a brief outline of the guiding principles of the Just Culture. 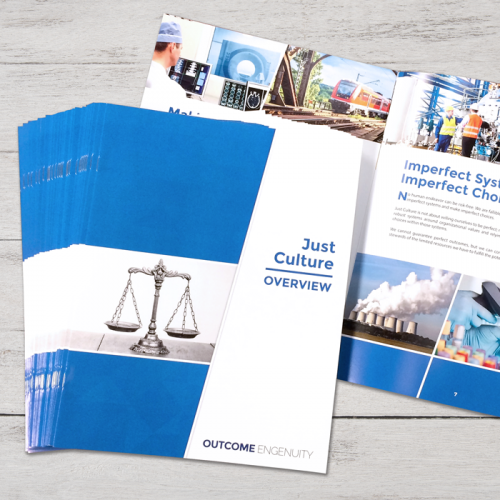 This eight-page booklet highlights the areas of focus within the Just Culture and describes the five skills of a Just Culture. The overview also includes a brief description of the three manageable behaviors: human error, at-risk behavior and the occasional reckless act. Whether utilized as a brief introduction for new employees or as a daily reminder for those already trained, this overview is a useful reference guide for an entire organization striving to implement Just Culture. A great introductory piece for the basics of what a Just Culture is.